The spacious accommodation comprises of, master double bedroom with en-suite bathroom and two twin bedrooms with en-suite bathrooms sleeps up to 6/7 persons. 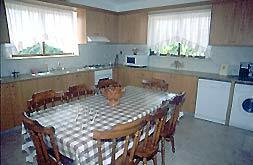 There is a large living room and a separate fitted breakfast kitchen. Air conditioning is available in all main areas. The villa is tastefully furnished and well equipped throughout. An extra bed can be supplied, on request. Patio doors from the lounge and two bedrooms lead to extensive open terraces, a 10m x 5m swimming pool, BBQ and private garden with lawns. The villa benefits from panoramic countryside views and it’s position gives total privacy. 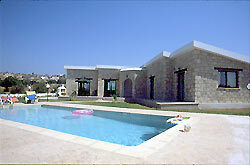 The recently constructed stone-clad villa is located midway between the popular resort of Coral Bay, with its sandy beach and a wide selection of restaurants and the village of Peyia. Less than 1km from the famous Coral Bay Beach and 10-15 minutes drive from Paphos centre which has a large selection of shops, restaurants & nightlife. There are Minimarkets, restaurants approximatley 500m away and the nearest shops are 1KM. Living room with TV, audio tape player, radio. 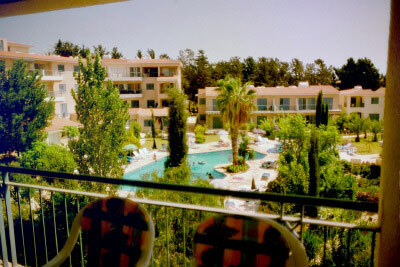 We have long term rentals in all areas of Paphos. We can also find many other properties in other locations just send us your contact details and your requirements.